This entry was posted in News & Articles on April 9, 2015 by Elon Perry. Residents in Gaza are using a 12-hour humanitarian truce to return to their homes, gather essential supplies and search for those trapped in the rubble. At least 85 bodies have been pulled from the rubble during the truce, a Palestinian health official says, the spokesman said. 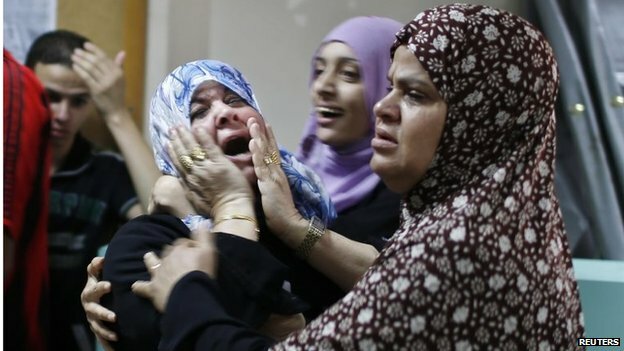 Thirty-nine Israelis have died. International talks on a longer truce have resumed in Paris. 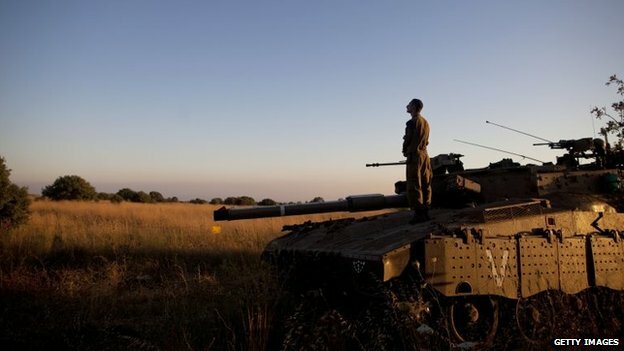 Two Israeli soldiers were also killed overnight, Israel’s military confirmed. In the district of Shejaiya, residents started flooding back from 08:00, despite warnings not to do so. The scene here is just astonishing – the most widespread destruction: buildings completely pulverised, cars thrown 50m (160ft) into the air on top of buildings, the facades of some block of flats completely ripped off. The air is pretty thick with the stench of death as people try to recover bodies and belongings. In the background I can hear a crackle of gunfire. Although a humanitarian ceasefire is in place, clearly people are still shooting. There is an Israeli drone flying overhead, and we’ve heard the sound of fighter jets. US Secretary of State John Kerry met the foreign ministers of Turkey, Qatar and some European countries in Paris on Saturday in the hopes of agreeing a longer ceasefire. 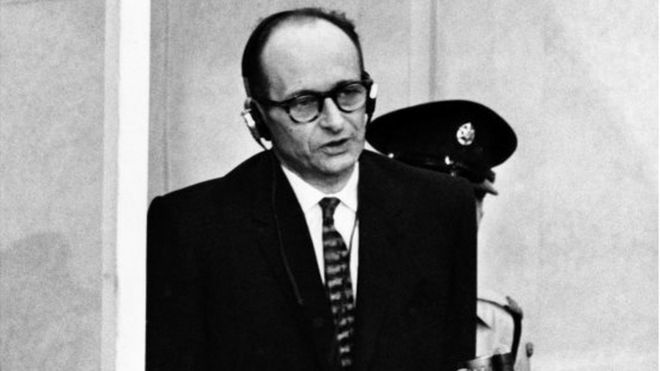 “We all call on parties to extend the humanitarian ceasefire,” France’s Foreign Minister Laurent Fabius told reporters. 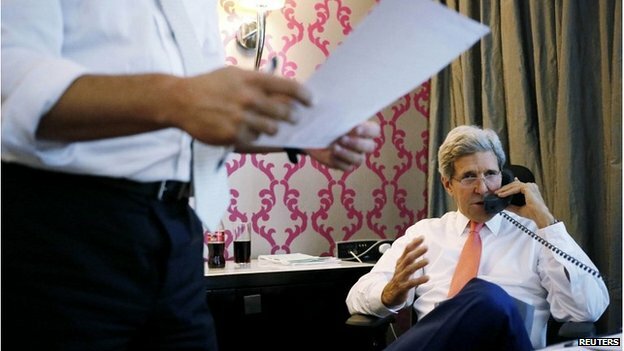 Mr Kerry spent a week in the Middle East attempting to broker a deal before leaving Egypt on Friday. Hamas insists that any ceasefire should include a lifting of the blockade imposed on Gaza by Israel and Egypt since 2007. Israeli government spokesman Mark Regev said Israel “appreciated” Mr Kerry’s continued efforts, and that Israel wanted “peace and quiet”. “The people of Gaza are not our enemy, our enemy are the people shooting those rockets into Israeli cities,” Mr Regev told the BBC. 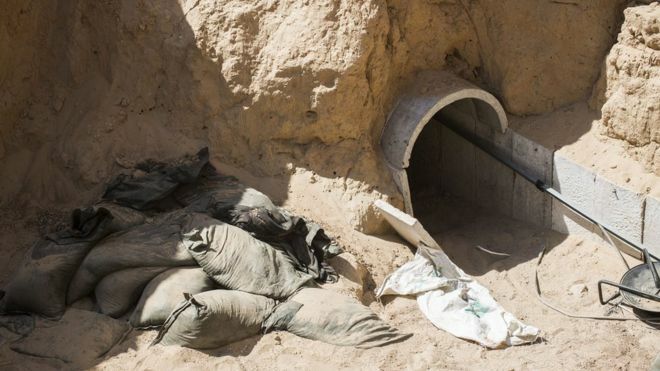 Israel is reported to want to continue operations against Hamas infiltration tunnels once direct conflict ends. 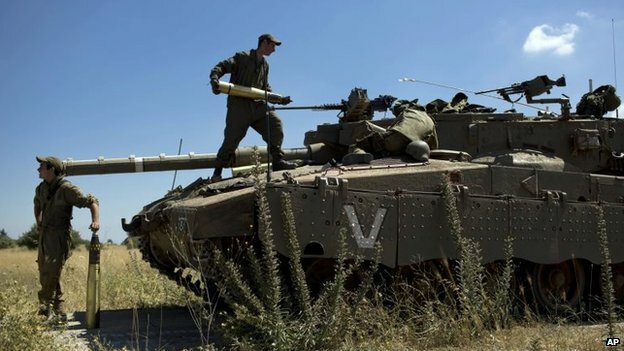 The 12-hour truce was agreed overnight, although the Israel Defense Forces (IDF) vowed to respond if attacked. The truce came shortly after Israeli Defence Minister Moshe Yaalon warned that ground operations in Gaza could soon be broadened “significantly”. Israel called the boy’s death the most substantial incident in the Golan since the Syrian conflict began in 2011. Two others, including the boy’s father, an Israeli defence contractor, were injured in Sunday’s blast, which struck their vehicle. The Syrian Foreign Ministry has condemned the Israeli air strikes, calling them a “flagrant violation” of its sovereignty. In a statement, it said the strikes were a sign of the “direct and continuous support” that Israel is giving to rebels fighting against Syrian President Bashar al-Assad and urged the UN to condemn the attacks. 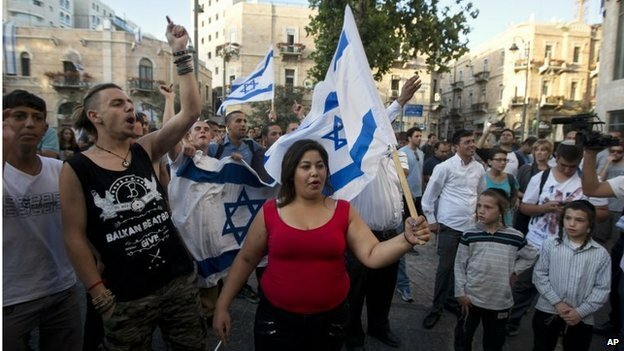 The teenager killed in Sunday’s attack, an Arab Israeli, has been named as Mohammed Qaraqara. “He was an excellent student; everyone loved him,” his cousin Salah Qaraqara told Reuters. This entry was posted in News & Articles on June 24, 2014 by Elon Perry. Does Middle-East peace process matter? Does the peace process between Israel and the Palestinians matter to anyone but themselves? Or, given the turmoil in Egypt, Syria, Iraq and beyond, has Israeli-Palestinian peace become an issue apart; less a barometer for regional tensions and more an intractable struggle that shows no sign of ending? With US-brokered talks between the two sides due to begin again this week there is an all-encompassing sense of diplomatic deja-vu. 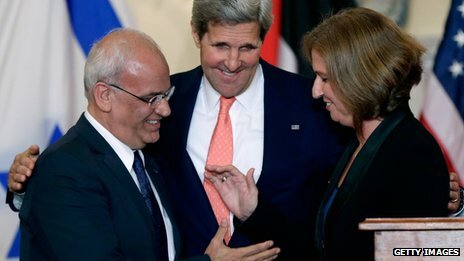 There are the almost ritual concessions to get talks going – the release of Palestinian prisoners by Israel; a cloudy understanding either to freeze or restrict new construction in Israeli settlements; and the equally public announcement of new building anyway as a conservative Israeli government seeks to placate domestic opponents of the peace talks to its right. This entry was posted in News & Articles on April 22, 2014 by Elon Perry. It ought to feel like a moment of optimism in the long and tortured history of negotiations between Israel and the Palestinians, but somehow it does not. It is always easier to see the problems than the opportunities in this part of the Middle East of course – but this time around it is hard to find anyone who thinks a dramatic breakthrough is within reach. The talk all along has been more of avoiding a breakdown than hoping for a breakthrough. And that was before Israel’s Construction Minister Uri Ariel announced the final go-ahead for new building in East Jerusalem and on the West Bank. Palestinians were outraged. These are precisely the kind of projects on the land which Israel captured in the war of 1967 which they regard as a deliberate attempt to choke off the chance for them to build their own state. Most countries view such building as a clear breach of international law, although Israel does not. Many Palestinians saw the timing of the announcement as a cynical attempt to scupper the talks, but even before then it looked as though the resumption of negotiations came about mainly – if not entirely – as the result of pressure from the United States and not through any strong impetus towards talks on either side. This was not always the way. 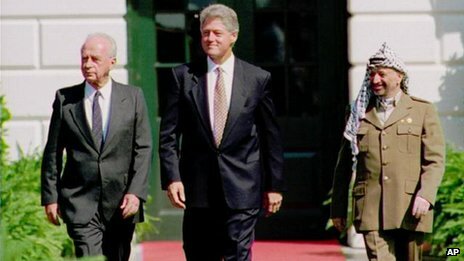 It is almost exactly 20 years since the then US President Bill Clinton brought the Israeli Prime Minister Yitzhak Rabin together with the Palestinian leader Yasser Arafat to sign an agreement based on extraordinary secret negotiations in the Norwegian capital Oslo. The president called it “the dawn of a new era for the Middle East and the entire world” and issued a stirring call for their achievement to act as a catalyst for the rest of the peace process. The truth is that today’s negotiators are taking a few steps down a road along which their predecessors travelled rather further. Back then, the prisoner releases were larger too. In the heady days of the mid-1990s Israel released, in stages, 4,000 Palestinian prisoners. This time around it proposes to release 104 over a nine-month period with the first 26 set free in the middle of this week. Palestinians see the gesture as inadequate, arguing that it relates only to a small group of men, some of whom were anyway nearing the end of their sentences. And they feel they should have been consulted about who was released. 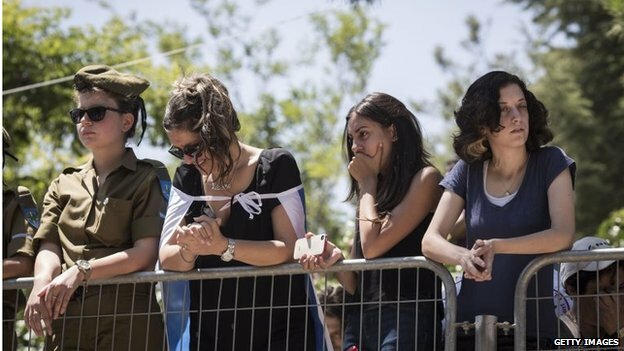 But many Israelis see the release as far too big a concession. One cabinet minister has warned it could be interpreted as a sign of weakness in the Middle East but the strongest opposition has come from families of Israeli victims of political violence. Oded Karamani’s brother Ronen, for example, was murdered in 1990. He was abducted by a Palestinian gang and was missing for three agonising days. When his body was found his hands had been tied behind his back. He had been repeatedly stabbed while he was helpless until he died. Oded showed us the family albums that record every detail of the smiling Ronen’s short life. The prisoner issue is a central one for both sides and all the core issues of justice and identity and history and morality are bound up in it. To many Palestinians, the prisoners are heroes – fighters in a just cause. 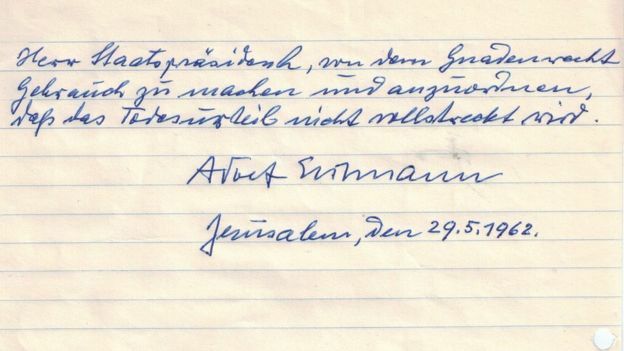 I went to Ramallah to meet one of the men freed during the Oslo prisoner releases. Abdel al-Anani works for Palestinian prisoners’ rights these days – he was convicted of ordering the death of someone accused of being an Israeli informer. It does not feel in the Middle East as though the moment has come when either of the two sides is preparing to make the full payment for a final peace. Anyone who knows the region can rattle off the familiar list of issues from the status of Jerusalem and Israel’s right to live in security to settlement construction and the rights of Palestinian refugees. There are still plenty of issues that divide the two sides – but they are at least now talking about them.